You can download these SFA documents as .pdf files, which require Acrobat Reader software to view them. Please tick the box to the left of the leaflet description, complete & submit the form or download via the link. CARBON MONOXIDE SAFETY LEAFLET – For your protection, please read the contents of this leaflet and keep it handy for future reference. Carbon Monoxide fumes have no colour, taste or smell and can be produced by appliances that use gas, wood, oil, coal or smokeless fuel. Carbon Monoxide can also be present in smoke from solid fuel, wood or oil appliances. Carbon Monoxide is potentially fatal,and even low-levels of the poison can cause lasting damage to your health. COMPLETE GUIDE TO SOLID FUEL HEATING – The Solid Fuel Association has produced a comprehensive guide to solid fuel heating which includes a range solid fuel appliances. Today’s modern Solid Fuel appliances are easy to use and simple to control. The heat output of most appliances can be quickly pre-set to the desired temperature and left alone. CURING CHIMNEY PROBLEMS – This Guide gives more technical information covering how a flue functions, diagnosing problems, difficult site conditions, flue lining and smoke testing. Smoke problems and lack of chimney draught are caused by poor chimney design and construction, insufficient sweeping of the chimney and any internal flueways in the appliance or unfavourable site conditions. DESIGNING SOLID FUEL INTO YOUR HOME – A comprehensive 35 page technical guide on all aspects of solid fuel covering choice of appliance and their installation, fuels selection, chimneys and their construction, ventilation and fuel storage. This publication is intended for Architects, Builders and Designers who propose to use solid fuel heating for domestic buildings. Guidance covers all aspects of design from initial selection of type of appliance and fuel through to chimney design and suitability. 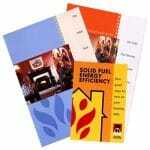 ENERGY EFFICIENCY GUIDE – Simple ways to make your solid fuel heating more efficient. Energy Efficiency is an important issue today. With rising fuel prices due to increasing worldwide demand and diminishing resources, the importance of fuel conservation is essential. Added to which concerns about emissions from burning fossil fuels create much discussion. GET THE BEST OUT OF YOUR BOILER – Valuable information about your boiler. As a general rule always choose those fuels recommended by the appliance manufacturer – failure to do so could invalidate the guarantee on a new unit. In smoke controls areas there are Regulations which govern the burning of solid fuels. GET THE BEST OUT OF YOUR OPEN FIRE – Valuable advice about open fires. GET THE BEST OUT OF YOUR ROOMHEATER – Valuable advice about your roomheater or stove. As a general rule always choose those fuels recommended by the appliance manufacturer – failure to do so could invalidate the guarantee on a new unit. In Smoke Control Areas there are Regulations which govern the burning of solid fuels. LINING OLD CHIMNEYS – For any fire to work successfully, it must be connected to a sound chimney and correctly sized flue. For any fire to work successfully, it must be connected to a sound chimney and correctly sized flue. The functions of a chimney are to safely remove the products of combustion from the fireplace or appliance to outside without causing danger to the occupants of the house or setting the house itself on fire. LINK UP – Why not link up your solid fuel fire to your existing gas or oil central heating system. This Guide gives full details of how to achieve this flexible heating option. Modern integrated or linked-up systems allow customers to utilise a solid fuel boiler alongside other heating technologies such as gas, oil, heat pumps or solar thus providing maximum flexibility. OPENING UP YOUR FIREPLACE – This Guide gives detailed descriptions about how to open up a fireplace including details about hearths, chimneys and flues. Opening up an old fireplace is like striking gold in your very own home. In addition to a glowing, warmer, more welcoming living room, you are creating a much healthier and more invigorating atmosphere, and adding to the character of your investment into the bargain. SAFETY GUIDE FOR SOLID FUEL USERS – The guide highlights the 3 golden rules of safety for solid fuel – proper ventilation, regular sweeping and the correct fuel. All the appliances in your home operate more reliably, efficiently and safely if they are installed and serviced correctly. Solid fuel appliances are no exception to this and following these few simple guidelines will ensure safe and efficient operation. THE COAL TRADE CODE – Buy your fuel from an Approved Coal Merchant. When buying coal or smokeless fuel, it makes good sense to make sure the person you are buying from has your interests at heart. A Merchant who is a member of the Approved Coal Merchants Scheme is fully trained in his trade and is committed to serving the customer. SFA GUIDE TO SOLID MINERAL FUELS – A guide to suitable applications for solid mineral fuels including: Open Fires; Closed appliances (Roomheaters, Multifuel stoves and Cookers); AGA type heat storage cookers & Gravity Feed Boilers. SOLID FUEL ASSOCIATION GUIDE TO WOOD AND MULTIFUEL – Coal merchants have always traditionally sold firewood alongside coal. However, renewed interest by consumers in burning wood, mainly in multifuel stoves, is stimulating a growing demand for wood fuel. Please Tick (required) I consent to my details being used to deal with my enquiry. Call our HELPLINE for information 01773 835400.